On January 22-29, 2012, the Philippines will be celebrating the “16th National Autism Consciousness Week” with the theme “Making the Rights Real for Filipinos with Autism” to advocate for the inherent rights of persons with autism and to support the promotion of the United Nations Convention on the Rights of Persons with Disabilities (UNCRPD). 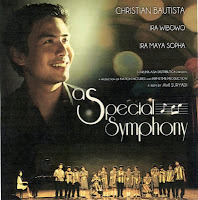 As part of the celebration, Autism Society Philippines UP CAMP Manila chapter will be having a special screening of the movie, “A Special Symphony” as one of the activities of the celebration. Date: February 12, 2012, 9:00 A.M.
A Special Symphony stars Christian Bautista, who portrays the role of a Filipino singer-actor named Jayden. The character is a struggling singer whose quest for fame is not quite successful in the Philippines. With his Aunt Penelope’s help, Jayden decides to fly to his mother who lives in Jakarta, Indonesia. There, he takes on a job as a music teacher for children with special needs. A Special Symphony is endorsed by the Department of Education (DepEd). “The movie is a tribute to special children. It depicts the essence and appreciation of their talents amidst their disabilities and how music serves as an effective therapy for them,” wrote the released advisory last August 16, 2011. A Special Symphony is distributed by Starlink Asia and A Production of Nation Pictures and Primetime Production. This is a film by Awi Suryad.